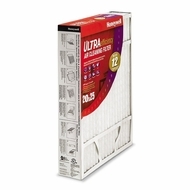 You can improve the air quality in your home with Honeywell's whole-house air cleaner filters. Today's tightly-built homes trap dust, allergens and more, which explains why poor indoor air quality ranks among the top five environmental risks to public health. Honeywell Air Filters are significantly more effective and efficient than standard one-inch fiberglass filters, plus they last up to one year. They're easy to install and sizes are available to fit all Honeywell plus most Aprilaire, Space-Gard and Trion Air Bear models. This filter's exact depth is 4.5 inches deep. Please measure the filter you are replacing or your filter boot to make sure it is an exact match.